For the treatment of Scaly Face (Knemidocoptes sp) and Air-sac- mites (Sternostoma sp) in ornamental birds. The Scaly Face mite and Air- sac mite are common infections in ornamental birds such as Budgerigars, Finches and Canaries. Regular flock treatments are necessary to control infestations in cage and aviary birds. Air-sac Mites are very common in the Gouldian Finch and the Canary. If left untreated this mite is notorious for causing deaths in Gouldians and may be partly responsible for the drop in the wild Gouldian populations. The mites are certainly responsible for the typical coughing canary. Air Sac Mites – (Sternostoma tracheacolum) is a 0.2 – 0.3 mm long, grey or black mite that lives in the lungs and air sacs of the bird. The life cycle is somewhat bizarre – females lay eggs in the lungs, eggs hatch quickly to become nymphs and then sub adults. Once they have had a blood meal the females move to the air sacs while the males stay put in the lungs to mature. Female mites move up into the syrinx, windpipe and sinuses with mature egg laying females returning to the lungs to lay their eggs. The total time from hatching to maturity is thought to be no more than 6 – 8 days. Interestingly the mites have also been found in water, on perches and in food – for such a small mite they are amazingly active! Transmission is usually between birds in close contact, via regurgitation at feeding and courtship. Female mites in the environment can crawl onto head feathers and infect other birds; this explains the transmission of the mite across the wire barrier of cages. Because they are so active, the mite can cause damage to all parts of the respiratory system. The mite droppings and body will cause an allergic type response in the lungs leading to difficulty breathing and respiratory noise. In the wild, a reduction of respiratory function is fatal as birds can no longer fly to feed and water, (infection rate in the wild has been measured at 63%). In aviaries, it is a longer slower process but will still lead to death as the bird becomes more and more debilitated. Mite infections will also lead to a drop in reproduction. Preventative treatments are necessary for all Gouldian and Canary facilities. Treatment involves using an insecticide to kill the adult mite and maintaining treatment long enough to kill all the newly hatched mites. “Drop On” Air Sac Mite Treatments (SCATT) need to be given at least 4 times a year. Because the mite can roam free in the aviary, a whole aviary clean down and spray with a bird safe insect spray must be done immediately after treating the birds. If treatment is not rapidly effective you will need to consult with your avian veterinarian. DIRECTIONS for treating air-sac mites: The recommended dosing rate is one drop per each 30 grams of body weight. 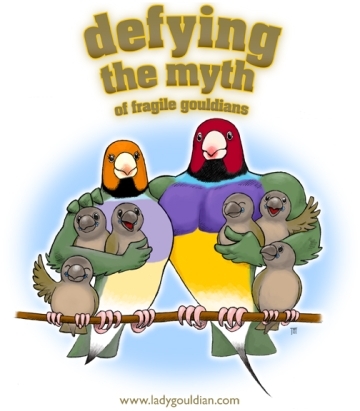 Gouldians can weigh from 15grams to 23 grams, but I have always used 1 drop each time I have treated with SCATT. Place the drop in direct contact with the skin, in a place where the bird cannot ingest any of the liquid into it’s mouth. I prefer placing the drop in the middle of the back, between the wings, under the feathers. The first time that you do this, it will seem very awkward, so you may want to request help from a friend to hold the bird. However with each application you will get more comfortable with the procedure and will be a pro in no time at all. DIRECTIONS for treating Scaly Face and Leg mites: This treatment may take up to 6 weeks. I apply the drop to the skin, as described above, one time, and then again 3 weeks later. After applying this first drop, I place a drop or two onto a cotton bud (Q-tip) and gently wipe it across the affected area. If the mite infestation is on the face, take care not to get any liquid into the eyes or mouth. 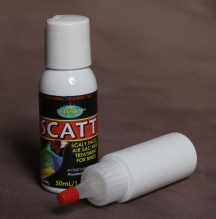 Each week thereafter I apply the SCATT liquid only to the affected area using the cotton bud method.